I picked up this drawknife and am trying to get an idea of when it was manufactured. I have been researching Bartons tools (D.R. 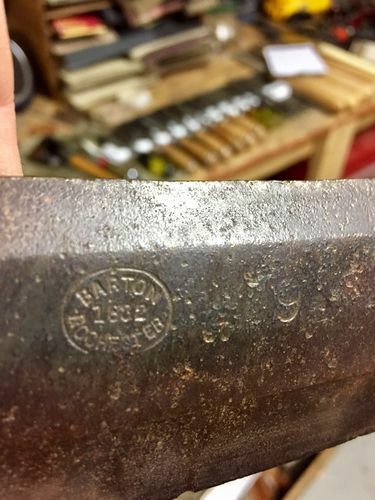 Barton) for a while but I cannot find any thing with the exact logo pictured. Specifically, missing the “D.R.”. Everything I have found that is similar says “D.R. Barton 1832 Rochester” in the oval shape. Any insight is greatly appreciated. Thanks! Wow! I’m pretty sure the “Barton”, without the D.R, was only used for an extremely brief time in 1832, when Barton was officially on his own, and no longer Barton and guild. I will try to find the literature on it…it’s been awhile since I read it. Thank you sir! Greatly appreciated. Wow! I m pretty sure the “Barton”, without the D.R, was only used for an extremely brief time in 1832, when Barton was officially on his own, and no longer Barton and guild. I will try to find the literature on it…it s been awhile since I read it.